The Tudor house is one of America&apos;s keystones- a type of home that has attracted homeowners for more than a century. Its basic elements-the steep gabled roofs, mullioned windows made of leaded glass, and half-timbering-are instantly recognizable and iconic. Tudor Style showcases the wide variety of Tudor homes and how American Tudor style differs from their English counterparts. renowned photographer Paul Rocheleau and architectural historian Lee Goff have traveled across the United States, from the suburbs of metropolitan New York to Lake Forest, Illinois, from St. Louis to Los Angeles, capturing the unique Tudor styles each geographic location offers. The Tudors featured in the book range from modest homes to grand estates, making this a perfectly accessible book for all Tudor homeowners and aficionados. In addition to displaying the architectural structures of these buildings, Goff examines the history of these houses, why they became so popular in the United States, and what their appeal is today. 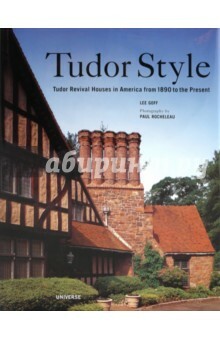 The First book ever on this wildly popular style, Tudor Style will delight architecture enthusiasts who have been desperately waiting for a book on this favorite architectural style. Литература на английском языке.